I had an abbreviated, whirlwind When Words Collide weekend this year. I arrived late on the Thursday before the convention, already running a sleep debt, and then promptly stayed up well into Friday morning catching up with my pal, tourguide and host, Kevin Madison. We left in the morning for Kananaskis so that I could do some location scouting for future stories (more on that later), and then I hit the con hotel in time to join Celeste Peters and Renee Bennett for supper. Unfortunately, I missed the Patricia Briggs workshop on Character and Voice, it took place before the conference, and I wasn’t able to get the extra days off of work. I still submitted my sample though, and both she and the critique group had some great things to say about my non-Thunder Road-related work in progess. Because I wasn’t entirely certain I’d be able to make it to Calgary at all, I didn’t sign up for any programming this year, not even a reading. 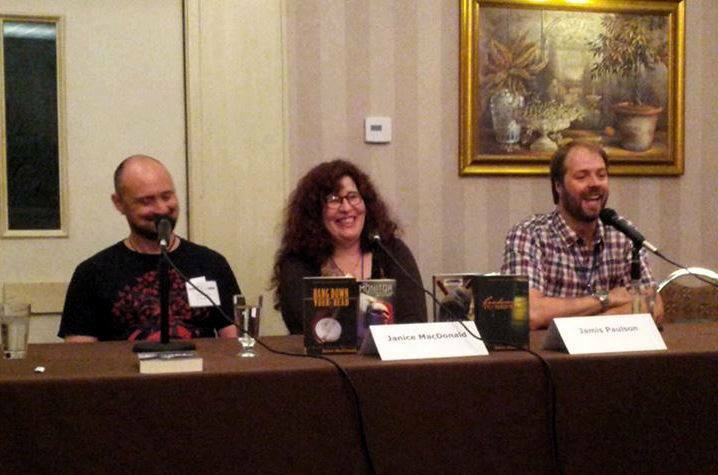 But my publisher, Jamis Paulson from Turnstone Press, was one of the Guests of Honour, so I crashed the hour with Jamis panel that fellow Turnstone author, Edmonton’s mystery queen (and all around awesome human being) Janice MacDonald was also guesting on. Some of my favourite folks are Alberta folks. I’ve said it before, I’ll say it again, I’ve met so many amazing people at the Calgary conferences I’ve attended. WWC feels like my home con even though its over 1300 KM away. I got to meet a bunch of my fellow critiquers for the first time. There were some great stories in that batch of first chapters and I think you’ll be seeing more than a few on the shelves sooner rather than later. It was lovely to hang out with Sandra Wickham, Ella Beaumont, and Jill Flanagan from the critique group, who missed no opportunity to remind me that I wasn’t there. They also made sure to drag me off to meet Patty before the con was over though, so there’s definitely no hard feelings! One of the other great things about going to cons is finally getting to talk in person with people you’ve only interacted with on Twitter or Facebook. I enjoyed sharing a drink with JW Schnarr, Charles Propelec and Jeff Campbell even if the service and decor of the sports bar were lacking. They were also kind enough to offer their sympathies about the Blue Bombers woes to me when they saw I was from Winnipeg. There were many launches taking place at WWC this year, but I was only able to take in one, due to my schedule, and that was the Urban Greenman launch. I’m so happy for Adria Laycraft and Janice Blaine. They’ve put together a beautiful book and I can’t wait to dig into the stories inside. I have so many friends who made it into Urban Greenman, and I’m not going to lie, I REALLY wanted to get a story in this collection. Alas, not to be, but I did write a story that I love, and I’m sure it will find a home eventually. I always tend to spend a lot of time in the Dealer’s Room at any convention I attend, if you can’t find someone in the bar, they’re probably looking at books and swag. And I brought too many (and yet not nearly enough) books home this year, including Urban Greenman, The Puzzle Box by the Apocalyptic Four (aka Eileen Bell, Randy McCharles, Ryan McFadden, Billie Milholland), The Tattooed Witch by Susan MacGregor, and Warriors by Barb Galler-Smith and Josh Langston. 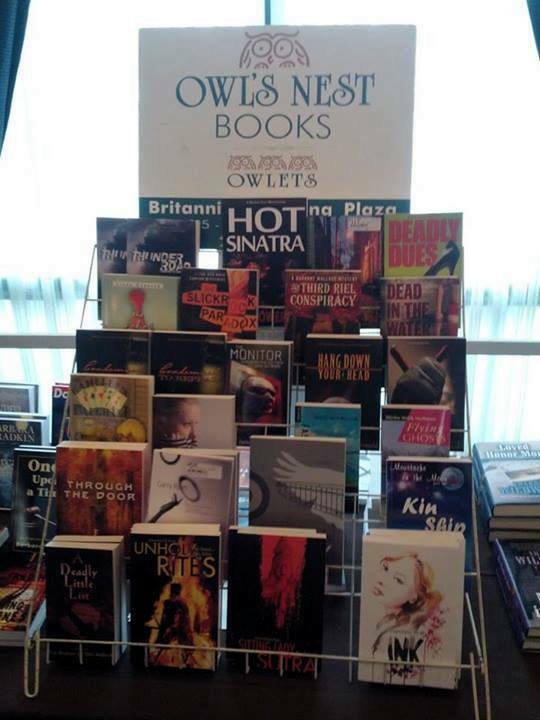 Also big thanks to Owl’s Nest Books for stocking Thunder Road at their table this year! When Words Collide is also the host conference for the In Places In Between short story contest. I have fond memories of this contest. Learning about it was a big kicker to get me submitting my fiction. The first short story I every finished and submitted to strangers went to In Places in Between. I didn’t win. I didn’t place. 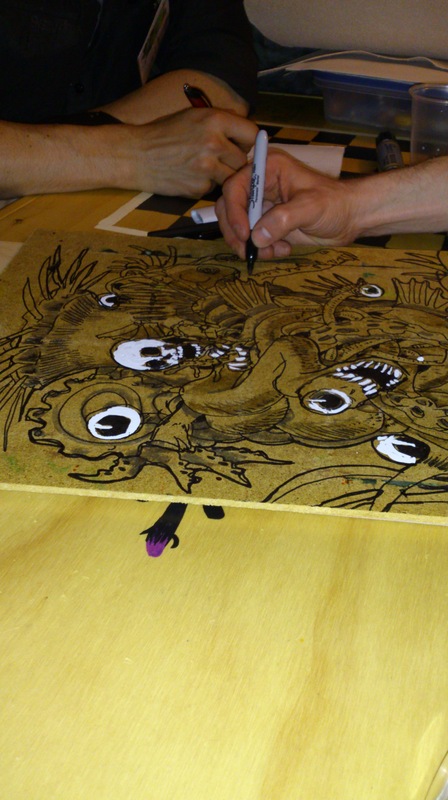 I didn’t have a hot clue what I was doing then, but having my work critiqued by strangers was an eyeopener. 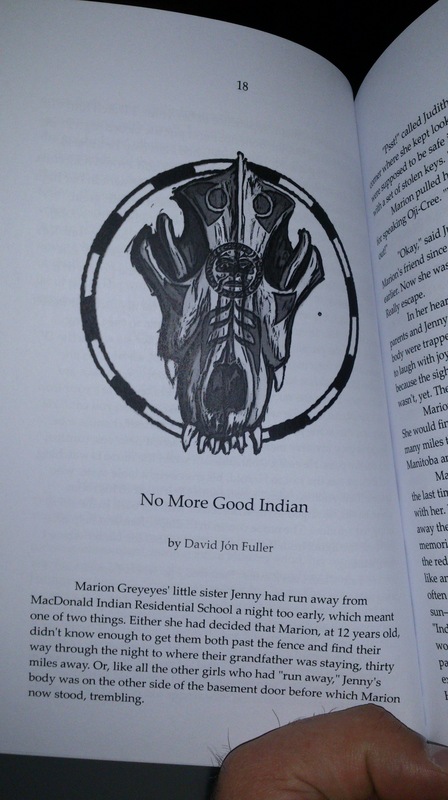 A member of my writing group has placed in it, the extremely talented Chris Smith (“Crow-Maiden”), and this year, I was surprised to see my copy editor, David Jón Fuller had a story inside (not surprised he made it in, David’s a great writer, but I had no idea he’d entered) and now I see that he took second place. Congrats, David (and you’d better come to Calgary next year)! A note on the parties (because there are always parties): Whether it’s bubble-blowing gauntlet or a bowl of punch so heavily spiked that allows you to see through time, romance writers know how to have fun. To Tim Reynolds, for the Irish Whiskey (Mmm Writers Tears), and the generous soul (I never caught your name, I’m sorry!) with that fine, fine, bottle of Kentucky Bourbon (Blanton’s, I believe), thank you for roaming the halls with your libations, gentlemen. I took things easy this year, knowing I’d be hiking through the Badlands the next day, and somehow I felt being dehydrated, hungover, and scrambling up and down coulees was a remarkably bad idea (it was, evidently, I didn’t take things quite as easy as I thought). Next year’s fantasy author guest of honour at When Words Collide is Brandon Sanderson! Which reminds me that I really have to finish writing my review/roundup for the Wheel of Time, now that its all done. But hey, that series was supposed to be a trilogy and it lasted decades and fourteen books, so if my review is a few months tardy, who’s going to complain? Brandon will be joined by Diana Gabaldon (Historical Fiction), Jacqueline Guest (YA, Historical), D.J. 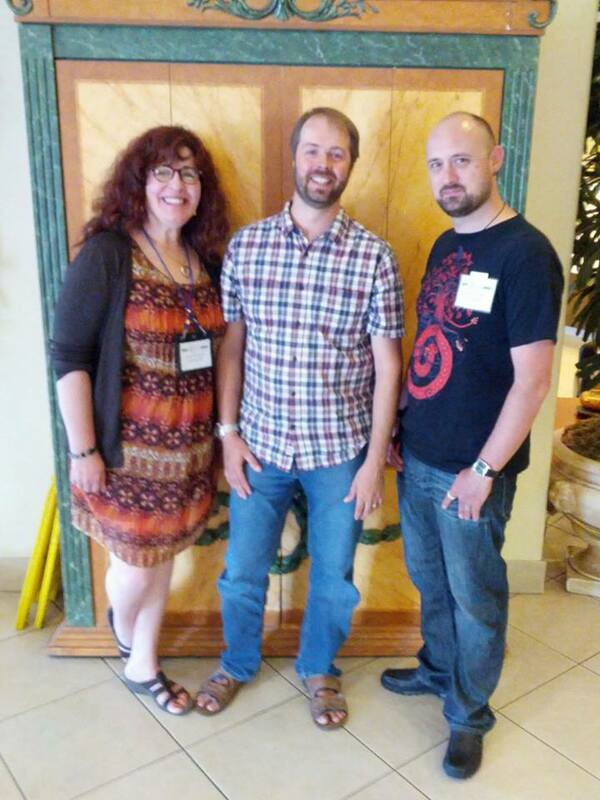 McIntosh (Mystery), and my Tesseracts 16 editor, Mark Leslie (as Director of Self-Publishing & Author Relations for Kobo). Thank you Randy McCharles and all of the WWC organizers, volunteers, members, and guests for another great year! 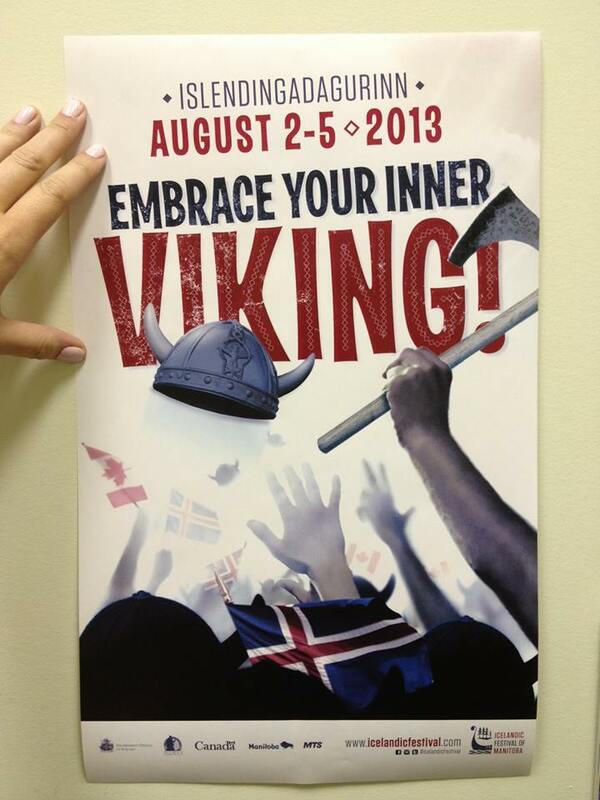 I’ve been invited to read at the New Icelandic Heritage Museum during Gimli’s annual Islendingadagurinn, the Icelandic Festival of Manitoba. This is very exciting! I had a lot of fun visiting Gimli while I was doing research for Thunder Road, so it’s a real treat and an honour to get to return as an invited guest. My readings and signings are scheduled for Saturday, August 3rd and Monday, August 5th at 12:00 & 2:00 p.m. Come on by, I’ll be reading from Thunder Road, and may just give a sneak preview of my forthcoming book, Tombstone Blues. The official museum poster for the event is here (and do check out what else they’re offering at the Festival and Museum! ), and Turnstone Press made up a fun poster for my reading. I’ve been attending the Manitoba Book Awards for years. I made a habit of it before I started writing seriously. Before I considered that I would ever be nominated for one myself. That first year, I went because an author friend of mine was up for a couple of awards. I felt my heart leap every time his name was mentioned, and whooped myself hoarse and clapped myself silly on his behalf. It felt decidedly strange to be sitting there listening to my friends and family whoop and clap on my behalf. I thought I knew something about nerves after my book launch in the fall; after returning to my old high school for the first time in twenty years and talking to the Grade 11 and 12 English classes. This was an entirely new sensation. I didn’t win either of the first two awards I was nominated for, but I was in exceptional company in both categories. By shortly after the intermission I had pretty much resigned myself to heading home empty-handed. 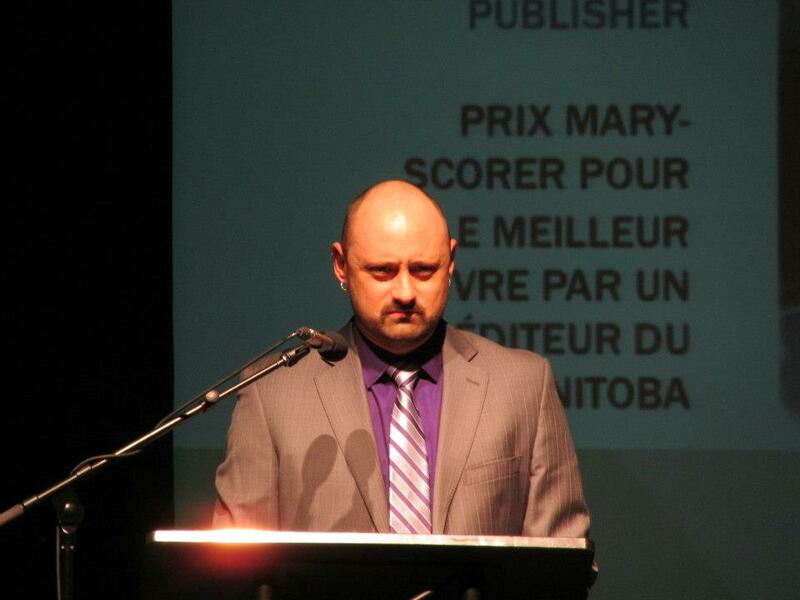 And then Doug Symington of Friesens announced Thunder Road as the recipient of the Mary Scorer Award for Best Book by a Manitoba publisher. This was very cool, as my book was printed at Friesens. 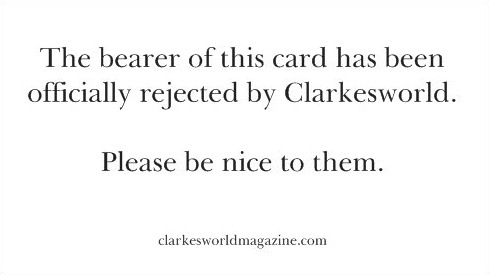 Ah, the small world of publishing! But even cooler was that my parents were sitting right next to me and got to see this. Their support has been huge all through my writing journey, so it was a thrill to have them with me. Photo courtesy of Saffron Scott with Creastra. So. If I was so damned happy, why in the hell did I make this face? Photographer Saffron Scott, would later compare my face to that of famous Internet meme “Grumpy Cat“. I could only jokingly retort that the Grumpy Cat was my face’s default position. I don’t remember who I was looking at. With the stage lights in my face, I couldn’t see anyone at all (good thing, The West End Cultural Centre was packed that night). I have no idea what I was saying at that particular moment, either. I barely remember what I said at all. People seemed to like it though (I’ll find out eventually, local SF&F convention mainstay, John Mansfield recorded it for me). I don’t feel I was able to talk to everyone I wanted to speak with, I just followed the crush of the crowd. Normally, I slip from conversation to conversation, congratulate the winners and then slip back to the comfort of the folks I know best. That wasn’t an option on Sunday night, but I’m going to enjoy that feeling. Who knows if I’ll have another night like that? So thank you to the jurors for selecting Thunder Road for three shortlists. Thank you to everyone who cheered for me, or came up to congratulate me after the awards. Thank you to everyone who attended the awards, period. Manitoba literature deserves to be celebrated in all of its forms (but especially when it’s full of gods and monsters). Finally, a hearty congratulations to all my fellow nominees and fellow award recipients. 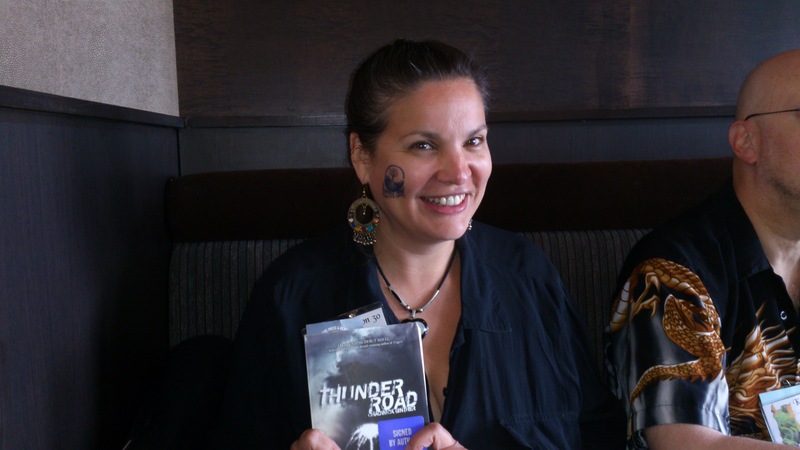 The Shortlists for the 2013 Manitoba Book Awards were released yesterday and I was (and remain) absolutely gobsmacked to see Thunder Road show up three times. I am trying to be realistic about my chances. I mean, I share the Margaret Laurence Award for Fiction shortlist with three former Book of the Year winners and two of this year’s Book of the Year nominees. I’d like to give big congratulations to my pal Karen Dudley and my editor Wayne Tefs on their nominations, as well as to Jamis Paulson and Sharon Caseburg for making Thunder Road look as good as it did. It is also great to see so many of my fellow Turnstone Press authors nominated for their excellent work. Finally, congrats to all the nominees, I am honoured to be in your excellent company, and thank you to the jurors, it’s not an easy job having to choose who makes up those shortlists. If you’re reading this, I hope you can attend the awards. I’d love to share a drink of commiseration/celebration with you. WINNIPEG, MANITOBA – The Manitoba Writers’ Guild and the Association of Manitoba Book Publishers are pleased to announce the Manitoba Book Awards shortlists. 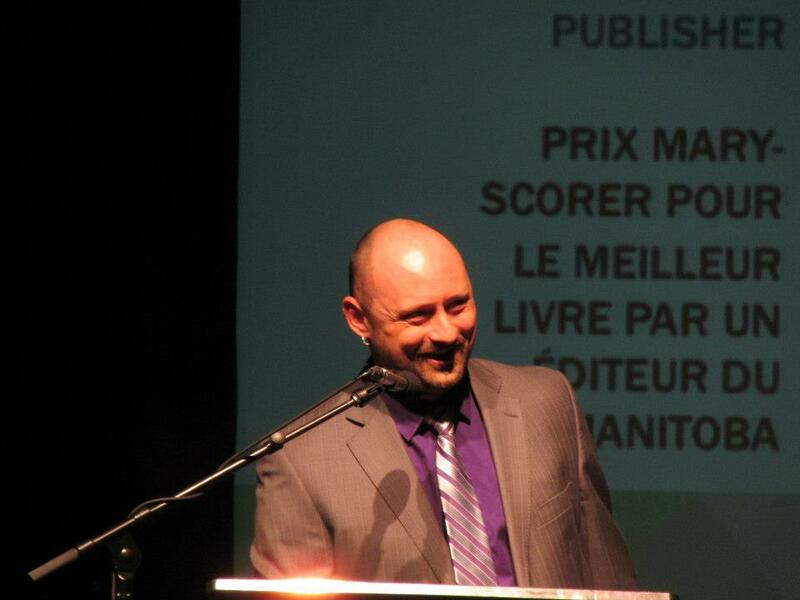 The awards will be presented at the Manitoba Book Awards gala, on Sunday April 28th at the West End Cultural Centre and hosted by Ismaila Alfa. Doors open at 7:15 p.m., with the ceremony beginning at 8:00 p.m. The event is free and open to the public. The shortlists and recipients are selected by a variety of juries, comprised of writers, publishers and other book industry personnel from across Canada. 7 Generations: A Plains Cree Saga by David Alexander Robertson, illustrations by Scott B. Henderson, design by Relish New Brand Experience, published by Highwater Press, an imprint of Portage & Main Press. The Marsh Keepers Journey: the Story of Ducks Unlimited Canada by Bruce Batt, design by Jeope Wolfe, published by Ducks Unlimited Canada. The administrators of the Manitoba Book Awards gratefully acknowledge the support of the following Book Awards partners: Aqua Books, the Canada Council for the Arts, Friesens, the Manitoba Arts Council, the Manitoba Foundation for the Arts, Manitoba Culture, Heritage and Tourism, McNally Robinson Booksellers, the Winnipeg Arts Council, and The Winnipeg Foundation. Another World Fantasy Convention has come and gone, and as my blog readers seem to enjoy these reports (if my site stats are to be believed) here’s the WFC2012 report. World Fantasy is my favourite convention, hands down. Maybe I imprinted on it somehow, World Fantasy 2008 in Calgary was the first away from home conference I ever attended. I talked comic books with Tad Williams, football with George R.R. Martin and Hemingway with Joe Haldeman. I met tons of people who became good friends. That is bound to make an impression on a guy. This year’s convention was also held in Canada, so I knew I’d also have a lot of friends to meet up with. It was an early start for me, as I flew off Thursday morning with friend and fellow Turnstone Press author, Karen Dudley. We’d hoped to meet up with another Manitoba writer, Shen Braun, who was arriving at the same time as us, but on a different flight, and split a cab from Pearson airport to the conference hotel (it was quite the jaunt as World Fantasy Toronto was actually in Richmond Hill, or so I kept being told). Unfortunately, Shen didn’t get in on time, but Karen and I did share the plane with Winnipeg writer Gerald Brandt. Even more luck, our mutual friends Eileen Bell and Ryan McFadden were on route to the conference and near the airport, so they swung by to pick us all up. It was a tight squeeze with five writers and their luggage in a Toyota Corolla, but we made it work. Arriving at the hotel was a homecoming of sorts. 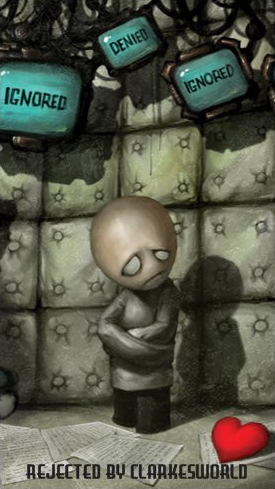 Every time I turned around, there was someone else I knew. A great feeling. Over the weekend, I not only connected with friends who are scattered across the continent, but met many new friends. We had to hustle because Thursday night, Turnstone was sponsoring the Ravenstone Books Launch Party for Thunder Road and Food for the Gods. I’m glad the party was Thursday, it meant I didn’t have it hanging over my head for the entire weekend. I know the way I roll, and there was no way I’d have been able to relax and enjoy the convention until the launch was over. 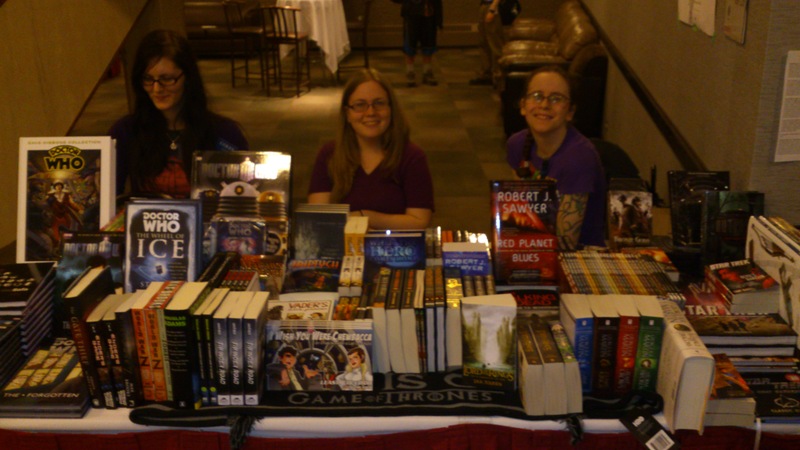 Marie Bilodeau from Ottawa served as our host and Bakka Phoenix was there to sell copies of our novels. We managed to get the room set up, and just finish having a bite to eat before it was time to open the doors and the worrying began. What if no one shows up? What if everyone shows up? Fortunately, we had just the right mix, the room was full, but not so packed that we couldn’t move about and mingle. I had a great time, signed a bunch of books, and met a few people I’d only know through Twitter or Facebook. It was over too soon, but it did teach me how stressful organizing an event can be. My hats off to people who do it all the time. 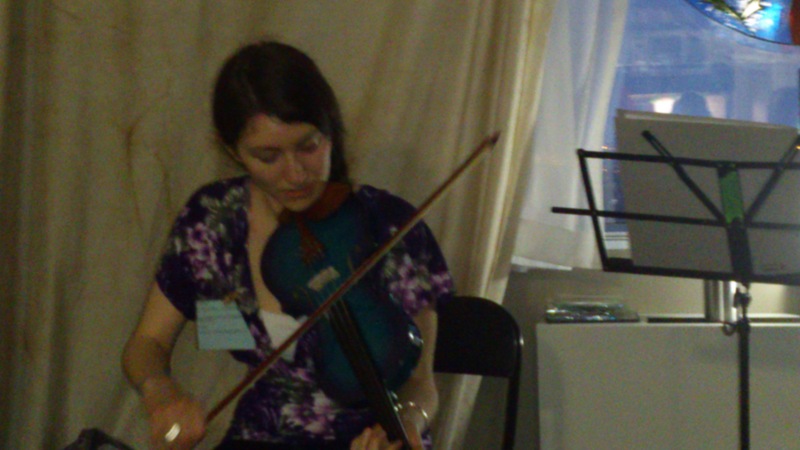 I took in Julie Czerneda’s reading from her forthcoming fantasy novel, A Turn of Light. I’ve been curious about this one for a long time, as I’ve always had my feet deeper in fantasy than in science fiction, looking forward to reading the whole book. The samples Julie read were enough to entice me to read the book when it releases. At my very first World Fantasy Con, I met Chandra Rooney. She was on a panel about writing tie-in fiction. I read her Tarot Cafe novel, The Wild Hunt, and interviewed her here. It was great to be able to chat for a bit after her reading. The samples Chandra read are unpublished right now, but you’re in for a treat when they do see the inside of bookstores. I think the only panel I took in this year was Sandra Kasturi’s interviewing World Fantasy special guest, Tanya Huff. Sandra’s a riot and Tanya is also funny as hell, and a consummate pro to boot. She shared some great stories from her career with a packed and eager room. Good times. Every World Fantasy Convention also includes a mass signing, putting every author in one big banquet room for two hours, and lets the signature hounds go wild. It was a better experience than I was expecting. I did actually sign some copies of Thunder Road, despite Fantasy giants like Brandon Sanderson and Patrick Rothfuss being in the same room. I handed out a bunch of my temporary tattoos and had fun chatting with Neil Godbout from Prince George (who’s debut YA novel, Disintegrate, is well worth checking out) and Robert Sawyer. After the signing had concluded I made my way up to the hospitality suites and flitted between the EDGE Science Fiction and Fantasy Fall launch, the Tor Books party and the Con Suite. I happened to be around when it was announced that James A. Moore had wrote a story about Dr. Doom and Barbie. There was a bet of some kind involved, I never did suss out all the details, something about 55$ and popcorn. James joked it was the best per word rate he’d received to date. Christopher Golden read the story aloud to a dozen or more listeners. The story, about 1200 words, complete with a beginning, middle, and end, was evidently written in about 45 minutes. It was amazing. James promised to put it up on his blog at some point. As soon as it surfaces, I’ll link to it, because it’s too good not to read. I picked up a copy of Shanghai Steam (complete with an awesome story by my bud, Shen) and read the first five minutes of “Back in Black” from Tesseracts 16, joined by fellow contributors Michael Kelly, Sandra Kasturi, Adria Laycraft and Randy McCharles. James L. Sutter, author of Death’s Heretic and fiction editor at Paizo did a short reading, and then led a fun Q&A about writing and gaming with his audience. I’m still holding out hope that Paizo will let him write a novel set in his Distant Worlds Pathfinder Campaign setting. It’s may be a bit of a fringe product, but it was one of the coolest game accessories I’ve seen in years, and it was obvious James had a real passion for it. Another Paizo author, Dave Gross, had the room next. Dave read from Queen of Thorns. It was a saucy reading for 9:30 in the morning. Man, I love the character of Radovan! I picked up Dave’s previous book, Master of Devils after Dave’s reading at When Words Collide 2011 in Calgary, and have been looking forward to his next book ever since. Suzanne Church won the Aurora Award for her short story “The Needle’s Eye” so I wanted to check out her reading (also, she promised candy). Suzanne read snippets from a few different stories (bought her issue of Clarkesworld while I was picking up my “rejected by Clarkesworld card), all very different, but all excellent. I had to run to make Helen Marshall’s reading from her new collection, Hair Side, Flesh Side, but it was worth it. A very intriguing story, and perfect delivery in the reading. I made it back from supper in time for the epic ChiZine party. I’ve met so many of the ChiZine authors, and they’re all awesome people in addition to being great writers, but the gravitational pull of that much awesome in one room made for a very crowded party. So I wandered the halls roaming between the consuite party, ChiZine party, and the hotel bar. It sounds bad, but I mostly behaved (mostly). I had to be up at 5 to get ready for my flight home.